Is it just me, or does "Lamarge" sound like the name of a 1980s drag queen? Spirit of Adventure's roughness around the edges is illustrated in how much I left undone despite winning. After getting the final screen, I consulted some German message boards and found that I'd missed one entire dungeon (Segan's Tower) and one entire town (Turmalin), each with their own quests. I never finished Rialdo's Castle. I never found 3 of the 18 runes, which is fine because I only ever mixed 5 spells and cast an offensive spell in combat less than a dozen times. I never upgraded to the best equipment, never found out what some of my equipment was for, and only tried a few magic items in combat during the last battle of the game. And despite all of this, I kept a fondness for the game until the end. It had some fun quests, a couple of interesting puzzles, a decent twist in the plot, and better combat tactics than I really found time to use. 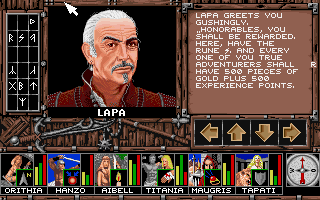 That I could miss a few areas means that it had genuine side-quests, something that remains rare in the early 1990s. It was a good foundation for Attic's later offerings. The city of Elfrad. Major roads keep their names despite a couple of 90-degree turns. Most of my hours since the last entry were spent mapping the city of Elfrad. Like Brataya, it had its own story that I had to piece together afterwards because I hit the key encounters in the order of my mapping, not in a logical plot order. The summary is that the mayor, Prior, wanted me to help him rid the town of evil by helping the "runemaster" unite the six "rune rings." I had collected two of the rings in Brataya and needed to get four more in Elfrad. The problem was that the ring owners had been mysteriously dying, so they were all in hiding. 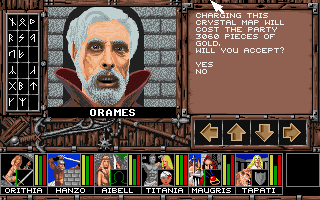 You don't seem the name "Olbrecht" enough in English-language RPGs. I had to track them down in their various bolt holes. One needed my help fighting some demons, one was in the morgue and I had to get someone to let me into the morgue, that kind of thing. There were a couple more interleave puzzles that were again redundant because you solve most of the game's puzzles just by showing up at the right place. 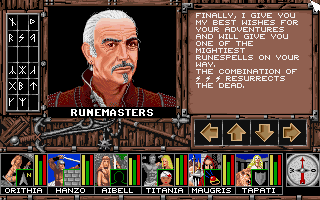 Ultimately, I got all six of the rings and brought them to the runemaster. He rewarded me with six runes and a "demon skull." The nature of the evil in Elfrad and how the rune rings would destroy it was left a bit vague. By the game's own logic, the "Resurrection" spell ought to be something like life-magic-body, but instead it just hammers away at "life." After Elfrad, I returned to the overworld and explored it systematically, although still managed to miss several locations. Besides another temple--where I created a couple of "fire blast" spells--the only other new location I found was a magic portal in the mountains. It offered transport to "Talusia" or "Garth." When I tried to go to Garth, I got a message that a mysterious force pushed me back. Talusia turned out to be the place I was already in (I guess the world is Lamarge but the island is Talusia? Or maybe the reverse? Also, "Talusia" is alternately spelled "Taslusia" on one screen). I figured this was something for an expansion and left it alone. Lacking any other ideas, I returned to Rialdo's Castle and tried to finish it, but a corridor that had previously been open was now cut off and I couldn't figure out how to get it open again. About this time, I remembered that Yakka Deepshaved, an NPC in Moon City, had offered to tell me the name of the leader of the Dreamers (the drug-pushing cult) if I could tell him the name of the mayor in Elfrad. Now that I knew the answer (PRIOR), I returned to Yakka. He told me that the Dreamers are led by someone named Tibuk, who is "somewhat out of this world because he appears to be everywhere at the same time." I knew that I had heard the name before, so I consulted my screenshots and found that he was the person that the demon-possessed Radin had been writing to from Brataya. The same screenshots also refreshed my memory that Radin had been possessed by a "Garthian" demon. Things were coming together. I returned to the portal and this time, it allowed me to pass through to Garth, which took the form of a relatively nondescript dungeon. Early in my explorations, I found a stockpile of Opitar; clearly, the drug was being shipped to Lamarge/Talusia from another dimension by Tibuk, a Garthian demon. And why can't my characters become dealers? Isn't this a "role-playing" game? "Garth" ended up being a long maze of secret doors and multiple staircases up and down. 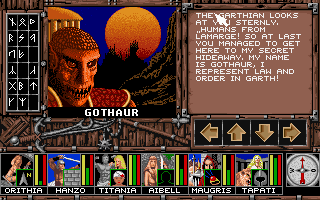 There were only a few enemy types--"Guldrons," "Gorcerers," and "Garthians"--but each was capable of mental attacks that severely damaged my party. Even with mental shields on, and the "Booster" skill recharging mental damage, and running from as many fights as possible, my party was roughed up. I had a mental healing spell, but my healer was only capable of a few of these before her magic bar needed to recharge. Potions helped a little. A lot of the time, I left my characters standing idly in a corridor for 20 minutes, playing SpurguX in another window, as their bars slowly recharged. Let me break off the narrative here to talk a little more about some of the game logistics. First, combat. It's reasonably tactical and yet invites you to be lazy. It starts with the magic skill that each character has active in the background. You can change these at any time, and some enemies respond better to certain skills. For any spellcasting enemy, for instance, you almost certainly want someone running "Sizzle." This also prevents you from casting your spells, but it's usually worth it. Titania switches among her three healing abilities depending on what we most need. Right away, the laziness factor comes into play. If I'm mapping a dungeon, I probably have "Compass" activated. Now combat comes along. Do I have the lead character switch her skill to something combat-oriented, then switch it back again when combat is over? Or do I avoid taking those extra 20 seconds and just plow through combat with the useless "Compass" remaining active? The considerations continue as you set your actions for each combat round. Through experience, you learn whether enemies most often respond to mental attacks or physical attacks. You might be attacked by multiple groups of enemies with different strengths and weaknesses. Every combat round, you have to decide whether to micromanage the party and set everyone's attack type and target anew, or just keep pounding the "1" key and using the same set of attacks over and over. Yes, the option should be clear for any serious RPG fanatic, but the combats get boring, and if you're trying to alleviate the boredom by simultaneously watching the new season of Travelers, as I was, then it's easier to pound the "1" key and then pay to heal everyone later. Until Garth, no individual combat in the game is really that threatening. Garth changes things with a one-way door that keeps you trapped in the dimension until you find the exit, and suddenly every physical and mental hit point is precious. Sometimes, a dungeon corridor offers this. Partly enabling laziness is the fact that no enemy is completely immune to an attack type. There are some brainless enemies like ghouls that don't even have a mind to affect with mental attacks, and some non-corporeal enemies like ghosts that can't be hit with physical attacks. And yet each is still susceptible to critical (instant-kill) versions of both attacks, which come along maybe 1 out of every 12 hits. Thus, by just spamming one or the other, you will eventually kill everyone. This is all a good thing, I hasten to add. I like that the game rewards you for careful planning but also gives you an "out." I'll also mention that throughout the game, the correlation between the difficulty of the battle and the experience and gold rewards is about 0. There are combats that last 30 rounds and leave you in tatters that deliver 30 experience points and 50 gold pieces, and others against single enemies that will leave you 150 experience points and 300 gold pieces richer. You learn to pick and choose your battles quite quickly. Dwarves are gold mines. So are bandits, but you don't want to fight too many bandits because they steal your stuff. You get the stuff back at the end of the battle, but you have to re-distribute and re-equip it, which is annoying. "Mage lords" are a good experience/gold balance. So are witches. It's almost never worth it to fight long battles against multiple parties; if you can't flee in the first round, you just have to keep trying. The most frustrating message in the game. Almost all the game's battles are random. There are fixed combats in less than half a dozen locations that I found. Thus, whether to fight at all, and particularly whether to continue fighting round after round, is almost always a player choice. Fleeing is a much more tactical, calculated decision here than in most games. If you fought every combat and never fled, you'd hit the max level within the game's first 8 hours, but you'd probably quit out of boredom before finishing the first city. I'm sorry I never really got to experience the magic side of combat tactics. (If anyone has a link to a full list of spells, I'd be interested in seeing it.) I made the "fire blast" spells that the manual recommended, but I could only cast a few of those before all my magic points were gone, so it didn't seem worth the effort to experiment with higher-level spells. Healing spells helped a little, particularly in the final dungeon. Some spells I never mixed because I lacked the runes, some (like "Resurrection") because I lacked the power. "Awaken" would have been useful but I never found a second "Mind" rune needed for it. "Light" is a bit of a mystery (as are the associated skills and torches) because all the dungeons are perfectly lit. There's a seed of a good idea in the spell system, but to acquire all the runes and get strong enough to mix the most powerful spells, you'd have to artificially extend the life of the game. I also ended the game well before I maximized my inventory options. 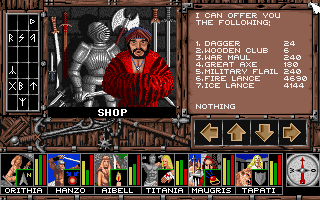 Shops in Brataya and Elfrad sold high-level magic weapons and armor, but I never had enough money for them because I spent so much on healing. Another unexpected expense came when the game wouldn't let me leave the city I was in because my "map crystal" was out of charges. I had to pay over 3,000 gold to recharge it. That's a lot of money for something I didn't even realize I would have to pay for. Again, this is a good thing. It means the economy is strong enough that you never run out of financial aspirations. I could have grinded more for gold, or tried to economize better and spend less on healing. I'm not complaining. Perhaps one complaint, though, is the mysterious nature of some of the inventory items. One of these days, I swear, we'll enter the era in which in every game, you can look at an inventory item and tell exactly who can wield it, what it does, and how it compares statistically with other items you have. There will be a clear distinction between quest items and other items. In Spirit of Adventure, I kept a bunch of gems throughout the game because it wasn't clear they were sale items and not quest items. I have a "skeleton key" that never came in handy, a "Radin's cape" that I can't wear, a "healer's ring" that I can't put on (seriously, what is that for? ), torches that I don't need, and scrolls that tell me nothing about what they do. More important, I have no way to gauge the relative worth of items. How much better is an iron shield over a wooden shield? Why can't I wear both a "mystic cape" and armor, and if I have to choose between them, which is best? No, why would you be able to equip a ring? That was stupid of me. The final dungeon comes to an end when you encounter a Garthian behind a secret door. The positioning of the secret door ought not to be possible by the game's normal conventions in which there's 10 feet of wall space between corridors, but fortunately I was checking every wall. 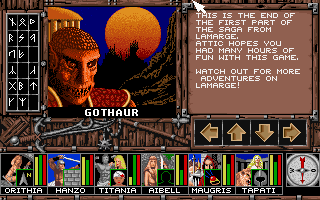 When I met the Garthian, named Gothaur, the first time, the game said it was "impossible to understand [his] tongue." I just had to brush past him and find a staircase back to the exit. 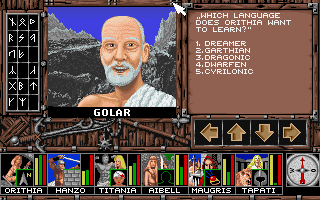 Fortunately, I knew where to acquire new languages--at 2,000 gold per lesson!--in Elfrad. I bought Garthian for one of my characters--I know of no reason to learn the five others--and returned to the dungeon. This time Gothaur had a lot to say. Gothaur is like a DEA agent of his dimension. Gothaur related that Tibuk was a fellow Garthian, using the portal to traffic Opitar to Lamarge and something called "Robiks" back to Garth. Tibuk was occupying a human body on our side. He gave me a horn that I could use to close the portal. I exited, returned to Talusia, and blew it. Closing off inter-dimensional travel just to stop a drug problem seems short-sighted. The question was then how to find Tibuk, but I had that figured out. Since the beginning of the game people had talked about how Rowena, head of the monastery in Moon City, had been different lately. I returned to her, and she immediately confirmed it, screaming that she had "hired [us] to fail." She put on her Garthian face and attacked. Asked if he wanted to also transform the rest of his body, Tibuk looked down and said, "Nah, I'm good." 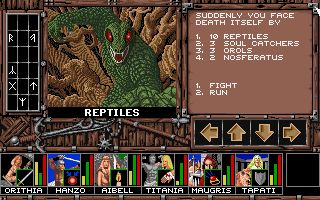 The battle was pretty pathetic--no single creature poses much danger in this game. To help, I employed a couple of magic items that I'd been saving for a tough battle, including Rialdo's Staff, which does up to 200 poison damage (a normal physical attack does less than 30). She soon died, her body turning to mist and fleeing to the vaults. I pursued her and found an upright coffin with the paralyzed forms of Rowena and some guy who was never explained. Tibuk re-formed and attacked, killing us in a scripted way with no chance at defense. What is the cat doing there?! Is the cat the real villain? For a while, I though this might be the legitimate end of the game. 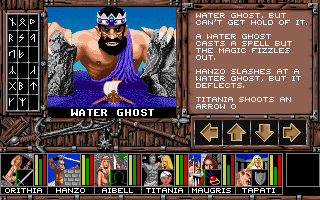 I have some experience with German CRPGs, after all; among other things, I'm still not convinced Dungeons of Avalon was winnable. But I decided to circle the city and see if any of the NPCs had anything to say in response to TIBUK. When I visited Yakka Deepshaved again, he had some new dialogue based on my possession of the horn. At the conclusion, he said, "You made it! Tibuk is destroyed and the Dreamers can't sell Opitar to humans any longer." What!? How did Tibuk get destroyed? I went to the monastery to confirm it and, no, Rowena wasn't destroyed. She turned into Tibuk and attacked again. But this time, after I defeated her the first time, the game let me fight Tibuk a second time in the vault. So I don't really know what happened there. Tell me something I don't know, Ramirez. Tibuk was no harder than the original Rowena battle, though. He soon died and I got the winning message above. It was a bit of an anticlimactic ending, but at least it wrapped up the plot. Since everyone had told me that the game was "unfinished," I half expected that to translate to the lack of a plot resolution. That staff is a bit overpowered. 4 points for the game world. It isn't terribly well fleshed out--in particular, the different races don't seem to mean anything after character creation--but the drug plot is at least somewhat original, and the various locations hold together thematically. The street names added a lot of flavor to the cities. 4 points for character creation and development. There aren't many choices during creation, but at least you're choosing from a fairly original selection of classes and races. Leveling up is rapid enough and feels suitably rewarding. Orithia levels up while the developers leer at her. 5 points for NPC interaction. 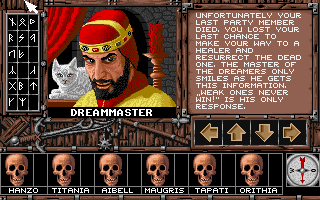 I wish the developers had offered more than three NPC portraits, but you'll never find me rating a keyword-based dialogue system poorly, especially when thoughtful use of those keywords can flesh out the lore and history of the game world. It's not Ultima-level quality, but it's still good. 4 points for encounters and foes. Half the monsters come from a standard fantasy template, half are original to the game. What I like here is that the type of monster matters for more than just how hard they hit. Their various types of attacks, defenses, and special actions have you adjusting your own tactics accordingly. That's what a good RPG bestiary should do. I also like that you can pick your battles and engage in what you might call "tactical grinding." Non-combat encounters are less plentiful and less impressive and offer no real role-playing. This guy looks a lot more difficult than he turns out to be. 5 points for magic and combat. See my comments above. Magic plays a lesser role here, but in some ways that creates a more balanced game. Most RPGs are so magic-heavy that regular combat actions are almost rendered superfluous at higher levels. 3 points for equipment, strengths and weaknesses already discussed. Titania: "Is it a trash can lid? A table top? What? Why are you looking at me like that?" 5 points for the economy. It could use more complexity, but it never gets to the point that it doesn't matter, which is the most important attribute. 4 points for quests, including a clear main quest and several side quests. No alternate endings or role-playing options, unfortunately. 4 points for graphics, sound, and interface, all of which are functional if not remarkable. 6 points for gameplay. I like its non-linear, open world; I just wish there was a little more in it. More locations, but smaller, would have been a better approach. Aside from the ease of the final battles, I thought that both the difficulty and length of play were both right on target. 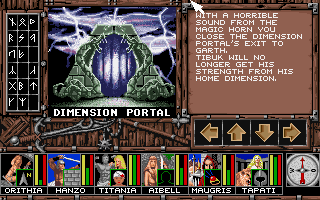 That gives us a final score of 44, which as I suspected puts it between The Bard's Tale (34) and Might and Magic (60). It's much higher than I expected going in. Earlier this year, a commenter suggested that I would "rant" about the ending, and I'm not sure why. It wasn't great, but it wasn't the shaggy dog joke that, say, Fate: Gates of Dawn was. Another commenter mentioned that it "promises more than it can deliver." I think that's a bit extreme. It lacks polish, certainly, but it at least tells a complete game. If some of the areas aren't finished, I can hardly complain given that I didn't explore all the areas that were finished. I have no idea what's happening in this box image. Neither, apparently, did any of the developers. Like many European games, even with English releases, it doesn't appear that western media much noticed Spirit. Computer Gaming World described it only briefly in a larger column about foreign games. European reviews were all over the place. PC-Spiele '92 gave it a 60/100, complaining about the lack of an automap (seriously, that bothers me in 2017 reviews, let alone from a year barely out of the graph-paper era) and the difficulty of early combats, which suggests the reviewer didn't make much use of the "run" feature. Power Play (75/100) laments it as another Bard's Tale rehash. 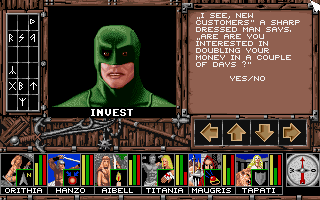 But ASM (80/100) called it a "strong adventure game" with a lot of positive features, and Joker Verlag (84/100) called it a "brilliant heroic epic in German." Every review notes its Bard's Tale ancestry, and that isn't in question. 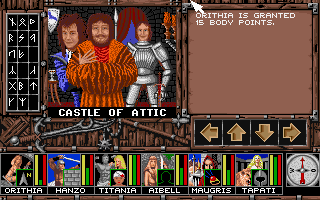 But what Spirit of Adventure does better than The Bard's Tale--what Might and Magic does a lot better--is provide a much greater sense of variety. Offer uniformly-size map after map of trash mob battles culminating in maybe one special encounter, like all Bard's Tale games do, and you've got a recipe for frustration and boredom. Spirit offers locations of different shapes and sizes, with multiple special encounters, side-quests, and low-key enemies that don't have both sides playing quick-draw on a NUKE spell every combat. Like I've said, it's not perfect. It could have used less town and more dungeon, for instance. But it was well-balanced and it didn't drag on forever. Unfortunately, it doesn't seem to have been a good experience for the developers. I get most of the story here from blogger Christian Genzel, who interviewed developer Guido Henkel in 2014. What I like about this article is that Genzel focused nearly exclusively on Spirit of Adventure rather than Henkel's more famous titles. In the interview, Henkel says that the game was supposed to have been subtitled The Dream Master as it was going to kick off an entire series under the Spirit of Adventure umbrella. Henkel says he and co-developer Hans-Jürgen Brändle were influenced by The Bard's Tale, Wizardry, The Magic Candle, Might and Magic, and Tunnels & Trolls. It's tough to detect the influence of some of these, but they could have gotten their devotion to keyword-based dialogue from The Magic Candle. What Genzel calls in in the interview "red herrings"--the Thieves' Guild, the other languages, the port in Brataya, several objects--were all supposed to play a role in expansions and extensions. The team envisioned multiple modules spanning from a central core. I'm sure glad I spent money on all those other languages! Repeatedly, however, Henkel mentions friction between the development team and their publishers at Starbyte. The publisher insisted on rushing production, developed the box and other production materials with no input from the developers, and cheated the developers out of their fair share of the royalties. They commissioned a Commodore 64 version of the game (in German only) with no input from the original developers. I couldn't get it to run (it kept asking for a disk that didn't exist in the package I downloaded), but reportedly it uses a top-down interface rather than first-person, and I can verify that the graphics are awful. Sick of "making other people rich," Henkel and his colleagues determined to publish future games under their own label. 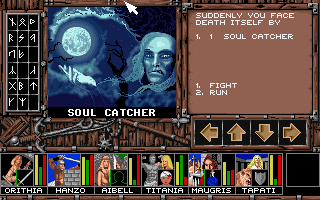 This unfortunately led to an abandonment of Talusia and Lamarge but gave us the three Realms of Arkania games (1992-1996), which use an update of Spirit's engine. Their success landed Henkel a job at Interplay, where he produced Planescape: Torment (1999) and Neverwinter Nights (2002). Since leaving Interplay, he has been involved in mobile gaming and novel-writing. We'll be seeing the Arkania series quite soon, so I'm glad I got to see this precursor. 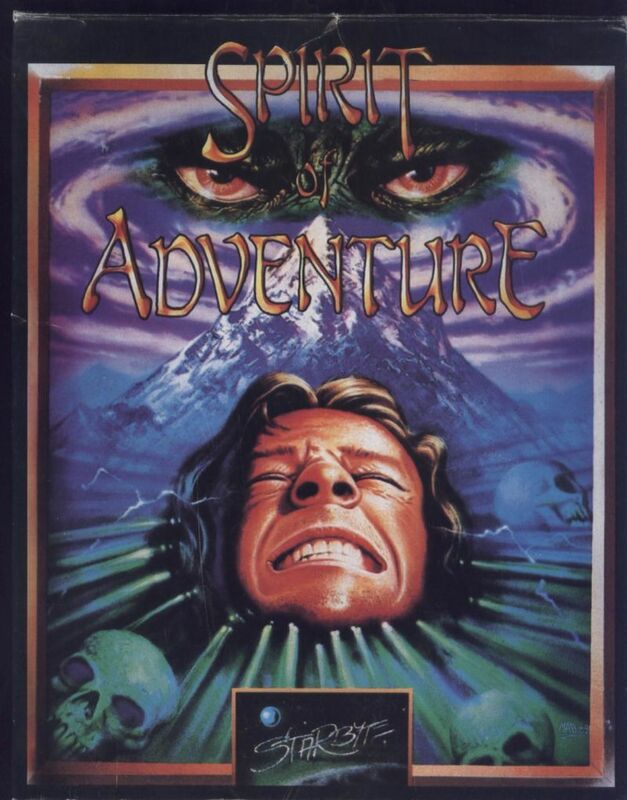 Spirit of Adventure isn't quite a "forgotten masterpiece," but it does perform better than you'd have any reason to expect. That's a refreshing change from the other titles this year. It's not Skariten's fault that I'm playing it the same year that I played Hera, Gates of Delirium, Quest for Tanda, The Wrath of Denethor, The Rescue of Lorri in Lorrintron, and Legend of Lothian, with Deathlord still to stare down. But that's what happened, and my patience for yet another Ultima clone was already pretty low. It went down another notch when I fired up the game and found that the developer couldn't properly spell its own name (there's no confusion about what they intended; the icon is a ballistic missile). The manual suggests a group of enthusiastic young developers who tried their best to make a good game (and convinced themselves they had), but honestly the whole game borders on being a scam, and it's not impossible that the guilelessness of the manual is part of the scam. Whatever I say about this game, it had some slick marketing. No shareware BBSes for these kids: Skariten was advertised using full-page ads like this one from Compute! 's Gazette in December 1987. The image, which also appears on the game box, is credited to a "Mark Mitchell" in the manual. This ad is the most competent thing about the game. Some other things stand out about the ad. First, the game price: the developers asked $29.95 for it. That's a lot for a freeware-quality game, but not a lot for a freeware-quality game that you're trying to convince people is a commercial-quality game. Then you've got the ordering information. Balistic's official address is a residential property in Delaware, Ohio, but the little bastards somehow got an 800 number and the ability to take credit cards, neither a trivial process in 1987. Look at the line "visit your retailer." If this game ever saw a store shelf, I'll eat the floppy. Imagine you were intrigued by the ad (you would be forgiven for thinking it was called Skarlten) and you ordered the game. When it arrived, you might have been put off immediately by the manual (shout out to the awesome Museum of Computer Adventure Gaming History, may it never close). It was designed by someone with a basic understanding of an early Mac word processor and a particular love for variety in fonts. The manual simply does everything wrong. It makes the amateur's mistake of confusing informality with humor. It ruins the professionalism of the ad and the box art with an immediate opening anecdote describe how half-assed the production was. It lists the lead developer's dad among the credits as "technical assistant." It make copious in-jokes. (Fire up the link, read the paragraph on page 20, and try not to cringe.) It varies fonts practically every page, including one that's only half-readable. Most important--as we'll see--it excludes crucial information about how to actually play the game. I'll summarize the relevant back story: "Skariten" is a dragon. For two centuries, he's rampaged unchecked across the land called Dvantiae, Avantiac, or some similar name depending on how you interpret the manual's font. No spell will fell him, no weapon will pierce his hide. Finally, the King of Averon tasks his son with the destruction of the beast. He recommends that the prince assemble magic weapons created by each of the races independently (but never used together): the humans' Spear of Slaying, the dwarves' Helm of Lion's Courage, the elves' Boots of Striding, and some rumored magical armor. Character creation consists only of a name and the choice of class between fighter and mage. Fighters can use no magic or magic items except dragon-slaying artifacts. The manual claims the mage can wield no weapons at all but then the game belies this by starting the mage with a staff. The game automatically rolls totals for strength, intelligence, constitution, and dexterity. Hit points are derived from constitution (x10) and magic points (for mages) from intelligence (x1). The game begins outside Averon, on a clearly-Ultima inspired background of forests, grassland, towns, and bridges. In addition to the attributes discussed above, the character also has to worry about food, morale, and fatigue. Morale is good when it's high, fatigue when it's low, and both are restored by resting so it seems silly to have both. The moment I started to play, the final blow to any chance that I would enjoy the game was struck. 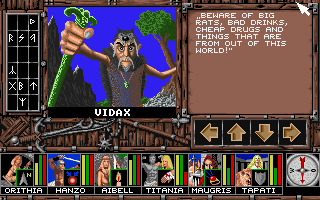 For the game interface, the developers opted to go with joystick-only. If you want to try one of the few game commands beyond simple movement, you have to hit the "fire" button and then select it from the menu that pops up, the only options being search, camp, exchange weapons, save, and quit. What makes this interface choice particularly unforgivable is that the developers implemented keyword-based NPC dialogues in the towns. When in town, the fire button is contextual. You wander up to a building and hit "fire" to enter it. You wander up to an NPC and hit "fire" to talk to him. (Both are accompanied by loading pauses of about 4 seconds at era-accurate speeds.) But having done the latter, you now have to use the keyboard to type your keywords. Here's an idea: since the player is going to have to be at the keyboard no matter what, why not map the "camp" option to the "C" key? And directional movement to the arrows? Wandering around town. There are more structures on the screen than you can enter, so you have to watch for the "Press Button" message to indicate where you can enter. Let's talk about the towns. "Over thirty separate buildings you can enter," the ad promises. Yay? The buildings are simple areas where you can buy food or weapons or maybe talk to an NPC. Some of them do indeed have two floors. Most games would have handled them as part of the main town screens, not as places you have to enter separately and wait for loading. More on those discussions. I like keyword-based dialogues with NPCs, and I'm impressed that these developers implemented them. That raises my estimation of the game. But the developers immediately squander that good will. First, NPC responses scroll across the screen, making it difficult to read them. Second, the developers don't bother to tell you what keywords prompt responses. They offer in the manual that NAME works but then say that if they told the player all the keywords, "then there would be no adventure." I get the sentiment, but you know what might have been useful? Telling the player that BYE exits the conversation, especially since it's the only way to do so without shutting down the computer. JOB also works, incidentally. 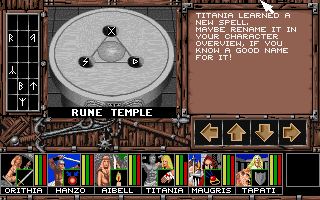 So the player basically needed to play Ultima IV to navigate this one. Inside a building, talking with an NPC. JOB: I farm the land. Let's move on to combat, which the ad describes as "in real-time, which is extremely rare, and a lot of fun." Fun to figure out, in particular, since the manual doesn't bother to give you any instructions about how to fight. Monsters don't appear in the wilderness, so you'll be walking along and suddenly realize that your character is no longer walking, which is a sign that the battle screen is loading. Five seconds later, it appears. The enemies immediately start swarming the character and converge on top of him within a couple of seconds. Fighting takes place on a blank black screen. Here, I contend with some foxes or something. At first, the only thing I could figure out to do was hold down the "fire" button, which causes the character to wave his sword at the enemies. But I died repeatedly, without killing any of the enemies. After some experimentation, it became clear that the game's approach to combat is to force you to run away from the enemies, then turn and strike just as the get into striking distance. You only have time for one blow before they're on top of you and thus immune to your attacks. You thus spend combat frantically running back and forth across the screen, periodically stopping, turning and waving your sword, then running away again. You get no feedback on how much damage you're doing or taking, or how many hit points you have left. "Extremely rare," I'll give them. "A lot of fun," no. To be fair, this accurately depicts how I would handle giant bees in real life. The mage, meanwhile, supposedly has four combat spells: "Magic Bolt," "Paralysis," "Lightning Bolt," and "Mind Blast." But in between goofy descriptions of what the spells do, the manual author forgot to tell the player how to actually employ them. No key that I press during combat seems to activate them. Creatures are almost all animals. They're not named, but the icons look like giant bats, bees, dogs, alligators, snakes, and such. One exception is that you occasionally encounter a single ghost. Except for the ghost, they never attack in parties smaller than two or greater than three. Fortunately, even the animal enemies give you gold. You also get experience, which causes you to occasionally "level up." When I quit the game, I was Level 4. Leveling, as far as I can tell, does absolutely nothing for you. It doesn't increase your hit points or any of your attributes, nor does it seem to make combat any faster or easier. The few weapons and items of armor sold in the game make up the only "character development." A single combat could easily bleed 80% of your hit points. To restore hit points, reduce fatigue, and increase morale, you periodically stop to camp. (There are healers who will restore you for 100 gold pieces, but I found that gold was too precious to waste on healing.) Camping takes about 20 seconds real-time, but it has no cost, not even in food, so there's no reason not to just do it repeatedly until your hit points are restored. Camping from the main menu. I gave the game my six hour minimum plus an additional hour. I dutifully circled the land, visiting towns, fighting enemies, spending most of my accumulated gold on food. I asked everyone about SPEAR, HELM, BOOTS, ARMOR, KEY, and DRAGON. The ad had promised "over 30 separate buildings," so I kept count of them so I'd know when I'd visited every city. When I knew I was missing a city or two, I used screenshots to make a crude map of the land. The game world, or at least most of it. I didn't get very far. On the Boots of Striding, there were three clues that when pieced together told me to search for them in the mountains "past the desert, at the edge of Avantia." The problem is, there's no place on the map where you encounter a desert and then mountains. Desert squares are all at the tips of peninsulas. I got the Key of Opening, the most useless artifact, as I never found anything locked to open. For the Mystical Armor, I had a clue to "ask Joshua about God," but I never encountered an NPC named Joshua. On the Spear of Slaying, an NPC told me that it had been carried by someone named Paul, who fell in battle, and that I should now seek the Spear "on a hill." That's it. You couldn't narrow that down? At one point, I happened to notice that the screen was saying "Press button," which it usually does only when on top of a city, when I was standing next to a mountain square. It took me to a "hidden" cloister of priests where I got one of the spear clues. I assume there must be other hidden cities, but looking at the map, I despaired at the idea of searching around long enough to find them. I equally despaired of searching every potential "hill" square for the Sword of Slaying. Does that look like a town to you? I give the game a 13 on my GIMLET. I didn't even think it deserved a 1 in character creation and development. It otherwise managed to tick most of the RPG boxes with 1 or 2 points. It did best in "economy," which is tightly programmed and offers rewards begrudgingly. I took off 2 points at the end for the horrid documentation. The manual did warn me that "this game designer has a twisted mind." You win, twisted game designer. You're probably pushing 50 by now, and you don't appear to have done anything else in game design, so it's too late for me to impart any life lessons. But if I could go back to 1987, I'd sit you down and explain that you have to earn the right to screw players around with invisible cities and undocumented keywords. And it's wrong to take something that your friends developed in your basement, slap commercial-quality artwork on the box, and sell it like a real game--regardless of how often EA does it. Good news when it comes to getting to the end of 1991 faster: I'm dumping Twin Morg Valley. I don't even know how to characterize it. It exists in some online game databases, but no one seems to be able to assign it a year. I think I put it in 1991 randomly. I can't tell which of the many companies going by that name its developer, "Eclipse," is. I can't find anything that looks like a manual or advertisement. I downloaded several versions and tried them. 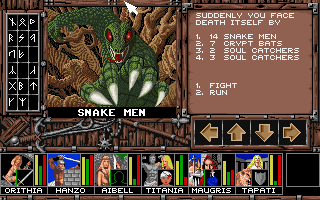 All of them go directly from the crack screen to a game in progress, with a monk character named "Kyksi Kaksi," which seems to be a play on the Finnish words for "one" (yksi) and "two" (kaksi). The game seems to take place in an arcade-like maze, with all control via the joystick. Pressing the "fire" button allows you to cycle among actions like "open door" and "get object" and "search for traps." There's no clear "save" function. I can run around the dungeon area picking up gold, food, keys, potions, and crossbow bolts. Picking up certain items adds to your offensive and defensive scores. There are a lot of secret doors in the walls. In any event, whatever I do, I can't seem to leave a somewhat limited area, nor have I found anything that looks like an enemy. I think we''ll have to call this one unplayable until we can get some more information about it. Even if something turns up, this clearly isn't a 1991 game. An encrypted message leads to some encounter options. Playing RPGs wouldn't be a bad way to welcome Christmas Eve, but I don't want to give the impression that I'm that far gone. I scheduled this in advance. It looks like I'll end 2017 with around 120 entries, more than 2015 and 2016. Alas, we won't see the end of the interminable 1987/1991 pairing until February at least. Spirit of Adventure continues to chug along in an inoffensive way. Events in the last town have increased my confidence that there really is a plot to the game and that we should expect to see some story resolution. It's not as packed full of content as Might and Magic but it keeps things more interesting than The Bard's Tale, and I expect in the end it will rate somewhere between the two. FYI, this is what happens when the whole party dies. Since my last entry, I've mapped three new locations: Rialdo's Castle (a dungeon), the city of Brataya, and the city of Werik, the latter so small that it probably shouldn't count. I'm guessing it's one of the features that some commenters have talked about: an unfinished area waiting expansion in later editions. It consists of one small t-intersection and a dozen houses with nothing in them. The screens explicitly say (in a meta-way) that the city is under construction, and "Lari," a friend of Rowena from Moon City, is waiting to take over as mayor. Shelves?! Everyone knows shelves are the last thing you put in! Rialdo's Castle was still a bit too difficult for my Level 3 party, but rendered a bit easier because of my recently-acquired "obstacle" skill, which greatly increases the party's chances of fleeing combat. I didn't flee every combat, of course, as I wanted to get gold and level up, but the skill allowed me to be strategic about which combats I fought. Even so, it's not infallible, and I had to return to Moon City for healing several times during the adventure for healing. This is the kind of combat you run from. The dungeon is 32 x 32, which seems to be the default for the game's maps, just a bit bigger than I normally like, although for dungeons, Spirit uses the "worm tunnel" convention by which every corridor has 10 feet of filled wall around it (i.e., corridors never share the same wall), reducing the number of squares to explore. It seems impossible that I didn't miss something. Walking through the dungeon periodically produces messages that it's cold and that every party member must eat one ration. I'm not sure the connection between the two things makes a lot of sense. Early in the dungeon at a key four-way intersection is a spinner. For some reason, my Amazon's "compass" ability didn't work in the dungeon, so I didn't realize what was happening. It screwed up mapping for a while before I sorted it out. This message was a bit mysterious, too. Among a lot of random combats was one fixed one with some bandits. Bandits steal things from the party members during fights, but you generally get it back at the end. It's not like The Bard's Tale where they can steal things and then take off before the fight is over. They're worth fighting because they have a ton of gold. Defeating them produced a "treasure map." There was no way to use or read it, but the game automatically told me when I entered an area that the treasure map covered. It alerted me to a secret door and then to a cache of bandit treasure that included a couple of new runes and some magic items, including an "ice lance," a mithril shield, and "Rialdo's Staff." Alas, I left the dungeon not knowing who "Rialdo" is or was, and annoyed by some large blocks of unused map space. I think I searched every square for a secret door, but to be honest, I don't know for sure how secret doors work. The only one I've found was pointed out to me by the map, so I don't know if you have to search for normal secret doors or just try to walk through them, and if the former if you ever have to search multiple times. With the new runes, I had the right combinations to create "Heal Body," "Heal Mind," and "Fire Blast" (I'm making up the names, but that's what they do). I returned to a temple and created the first two without problems, but the game said my level wasn't high enough for the damage spells. I wasn't too vexed as I've had one of my spellcasters running the "Sizzle" skill, which negates all magic--extremely useful against spellcasters--and I'll have to turn it off if I want to cast spells of my own in combat. A "sorcerer" can't do much against me if he can't cast a spell. The city of Brataya was the same size as Moon City and took as long to map and explore. But it had a diverting quest that unfolded as I visited special locations and talked to various NPCs. The short story is that the city's fish had all gone bad--something confirmed to me when I visited a pub serving fish and all the characters got sick. When I visited the city's port, they said that it was closed "because of the disease and the tarantula monster," the latter of which was never explained. The large city of Brataya. The mayor, Lapa, asked me to look into the issue, mentioning that he'd already commissioned two notable citizens, Somar and Radin, to find a solution. Radin even has a street named after him. I met a postal worker named Grinan who took the party boozing. After a couple of drinks, he offered to let us have a peek at undelivered letters for 100 gold. One of them was written by Somar to a man name Prior in Elfrad, saying that Somar had unmasked Radin as a traitor. He wondered why Prior hadn't responded to his earlier letter confirming such. He also mentioned that a magic mirror can exorcise a Garthian demon. This latter bit was later confirmed in a library, where a book, authored by Somar, in which he discussed someone named Nuk accomplishing this feat. A nearby shop was selling "Nuk's mirror." A possible nod to a competitor in the library. When I found Somar, he told me that he couldn't stop the disease but he gave me a book with "hints" and shoved me out of his house. When we looked in the book, it turned out it had a hollowed out space with a key in it. An accompanying note basically said that the walls have ears, but that we should take the key to Narim, a temple guard. We did that and Narim gave us a key to Somar's mansion. I wasted way too long on this thinking it was an anagram because you can get RADIN, GARTHIAN, BEWARE, FROM, OF, and KILL out of it and I figured the rest must spell something. Later--while I was composing this entry--I remembered my Might and Magic training and realized it was simply an interleave, requiring you to take the first letter from each set until it's all used up: BREAK A STONE FROM THE WALL AND YOU'LL FIND A RUNE RING. Apropos of nothing, the weapon shop in the city has some cool stuff. Not solving the puzzles at the time didn't stop me from finishing the quest, since the game just assumes you've decrypted them and gives you the associated menu options. (Although I think not knowing the right course of action caused me to die and forced me to reload in Somar's place.) In Radin's house, I found his rune ring and the undelivered letter to Prior along with a note Radin had written to someone named Tibuk saying he'd gotten hold of the letter "just in time." I finally found Radin in one of the houses. I never got any specific intelligence that he was possessed by a Garthian demon, but the game offered me the option to use Nuk's mirror, so I did, and the demon fled his body. He thanked me, said he'd figure out a cure for the fish, and told me to re-visit the mayor. Lapa gave me 500 gold pieces and 500 experience points, which is one of the few examples we have from the era of quest-based experience rewards. Mostly only the Gold Box games have done this. Oh, and he gave me a rune I already had. I closed the long session with a re-visit to Castle Attic for leveling. Then, I'll continue systematically exploring the wilderness for new locations. An interface complaint: when you view your party members' character sheets, you initially select from numbers 1-6 corresponding with the character you want to view. But if you then want to change the character you're viewing, you select from 1-5, or from among the current unselected characters. That means there's no consistency in which number goes with which character. For instance, if Orithia (#1) is selected, Hanzo (#2) is activated with "1" because he's the first character currently not selected. But if Aibell (#3) is selected, then Hanzo is selected with "2." You'd be surprised how often this slows things down and makes it easy to miss a character when you're trying to check inventories and such. A long time ago, I complained when the compass in Dungeon Master actually pointed north (which a real compass does) instead of the direction I was currently facing (which most games do). Now, in this game, I had the opposite reaction. The leader of the monastery in Brataya is named "Heron" and he's one of several NPCs this session to dress up like a superhero. He had nothing useful to say except that his Moon City counterpart, Rowena, "did good work until a few months ago." This is the second bit of intelligence that suggests something weird is going on with Rowena. An "investor" in the city had the same costume. I gave him 400 gold pieces and totally forgot to return to him. Brataya had a seer name Vidax whose prognostications were as useless as the guy in Moon City. Although maybe it's a clue that aliens are responsible for the opitar epidemic. I'll close by mentioning that as part of my holiday vacation, I indulged myself by purchasing Star Wars Battlefront II because I had greatly enjoyed its namesake from 10 years ago. I have no interest in multi-player gaming (and thus no stake in the debate over "play to win" and "loot boxes," although I can understand why so many gamers are upset about them), but the previous title of that name had a fun single-player campaign and an equally-fun "galactic conquest" mode in which you played with and against bots. That's all I wanted. I don't always want to play RPGs. Sometimes I just want to sit on my couch and drool and shoot things. Well, I can't tell you how disappointed I am. There's no galactic conquest. The offline bot-play mode, "arcade," has no scenarios in which you can drive vehicles or engage in space-based combat. The earlier Battlefront II was even a quasi-RPG, with character upgrades based on achievements. This game may have something similar with its "cards" or whatnot, but I haven't been able to figure out how that works yet. The solo campaign tells a decent story, I grant you, but what I really wanted was the old Battlefront II with better graphics--and to be honest, I don't even think the graphics from the original have aged that much. I'd have been happier just buying a used copy of the original game--if it worked on the Xbox One. This is all to say that you'll probably see some decent progress on RPGs over the next week because my couch plan was ruined. Happy holidays, everyone, and thanks for your continued support.